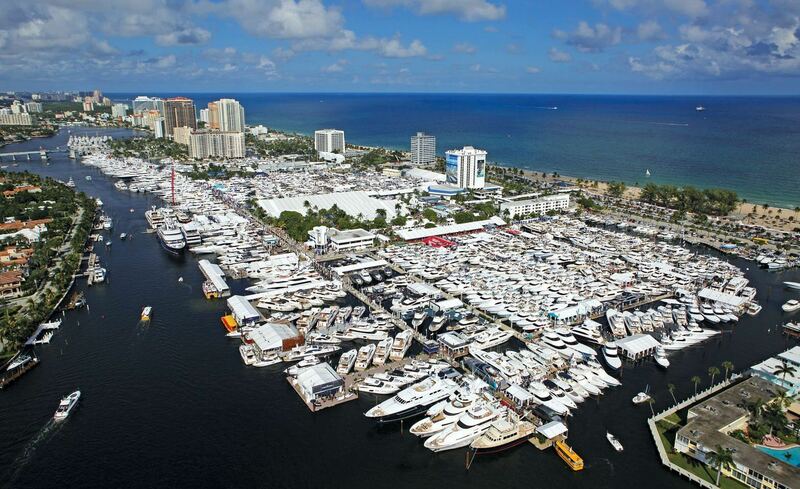 Fort Lauderdale, Florida will host the 59th annual Fort Lauderdale International Boat Show on October 31- November 4, 2018 also known as FLIBS. Established in 1959 this is one of the largest in-water boat shows in the world displaying the most luxurious boats. Every year, the show exhibits a vast array of the industry’s latest boats and yachts of all sizes, worldwide debuts, plus a mixture of marine products and accessories to enhance the nautical lifestyle. From yacht builders and designers to exotic cars and brokerage yachts, this show has something for everyone! Many of the vessels comprising this year’s lineup are 1,200 sportfishers, inflatables, catamarans, fast cruisers, and superyachts. FLIBS is also the place to check out industry trends. Expect to see oversized beach clubs—large sun decks positioned at water level—outfitted with full-sized lounge chairs, shaded seating areas, and even infinity pools and jacuzzis. Today’s yachts are also built with jet-ski docks, steam chambers, underwater security cameras, basketball courts, cinemas, and high-tech entertainment systems with invisible speakers and HD laser projectors. Captains can control navigation, monitor equipment and manage other onboard functions remotely from an iPad. You’ll find new innovations for exploring both the ocean and ports of call, including motorized sport SUPs, personal electric swim motors, drones, portable electric bicycles, air tenders, and Universal Hovercraft. Superfast tenders—some can reach speeds well past 70 knots—are equipped with Champagne coolers, underwater lights, grills, and concert-quality sound systems. From tenders to brokerage megayachts at FLIBS 2018 you have plenty to see. Here are five megayachts you should check out, making their American debut. And if you’re serious about superyachts you should definitely book an appointment to see one of these at FLIBS. Elandess: Abeking & Rasmussen constructed an underwater viewing lounge for this 244-foot (74.5-meter) superyacht. Her project manager calls it a “natural cinema.” It’s usable when cruising, too. Utopia IV: This is the first time that Rossinavi will have a new yacht at FLIBS. The shipyard built the sleek 207-footer (63-meter) for private and business use cruising at a reported 26 knots. Ferretti 920: The Ferretti 920 is meant for speed. Top end with the standard engines is 26 knots. Optional engines, meanwhile, promise up to 30 knots. Ocean Alexander 90R: The “R” stands for “Revolution.” This ultra-modern motoryacht is different than any other Ocean Alexander model. It’s something you simply don’t see on motoryachts in this size range. Azimut Grande 25 Metri: Making her USA FLIBS debut. LOA: 82 feet with a top out around 29 knots. Expected attendance is about 110,000 people during the five-day event. The number of exhibitors will be about 1,200, from 52 nations with about 1,500 boats on display. Ticket prices are $33 for anyone 16 or older, $15 for children ages 6 to 15, and free for children younger than 6. A two-day adult ticket costs $57 and is good any two days from November 1-4. The vip package is $300 with a lounge open to attendees 21 or older. With it’s estimated more than 50,000 yachts and boats in this South Florida city, it’s easy to understand Fort Lauderdale is called the “Yachting Capital of the World”. The city has 300 miles of navigable canals, waterways and two wide, deep inlets with direct access to the Atlantic shoreline. Thanks to its expansive Intracoastal Waterway system that winds through beautiful stretches of land, nightlife, dining and shopping destinations as well as breathtaking celebrity homes. With all of the dining, shopping, recreational and nightlife destinations in Fort Lauderdale, your fun never has to end. Head into Fort Lauderdale and enjoy all this great city has to offer. A bite to eat at a waterfront café or a night out at a local music venue (the Revolution Live is especially popular) is a great way to cap off your boat show fun. Fly with Privaira into the airport of your choice—Ft. Lauderdale International (FLL), Ft. Lauderdale Executive Airport (FXE), Pompano Beach Airport (PMP), or Boca Raton Airport (BCT)—and settle in for a weekend of state-of-the-art superyachts, cutting-edge sports cars, and the city’s most exclusive experiences.